Conceal carrying is more than just placing a handgun on your waist and carrying it around. You will want to conceal carry the smart way so that you are not attracting unwanted attention or stirring up suspicion. There are tons of concealed carry gear on the market that you can find that will assist you with discreetly conceal carrying. 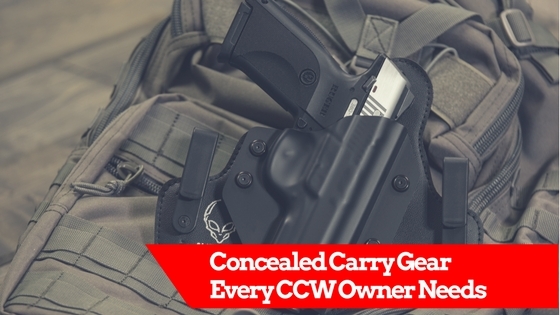 There are concealed carry gear that will help you properly carry your weapon. Not only that but you will want some gear that will assist you in quickly and properly laying down an attacker. In this post I will be sharing the suggested concealed carry gear that I use and why they can be helpful for you. Now I’m going to catch some flack from those who proudly support open carry. This post isn’t meant to debate the validity of open or concealed carry. However, where I live it is only legal to conceal carry and it is actually my preference. When you are conceal carrying IWB then you will want something that is comfortable, durable and breathable. You will also want a holster that displaces the weight of your handgun across your waist. If the weight isn’t properly displaced then it can cause your pants to sag and drop which stirs up unwanted attention. 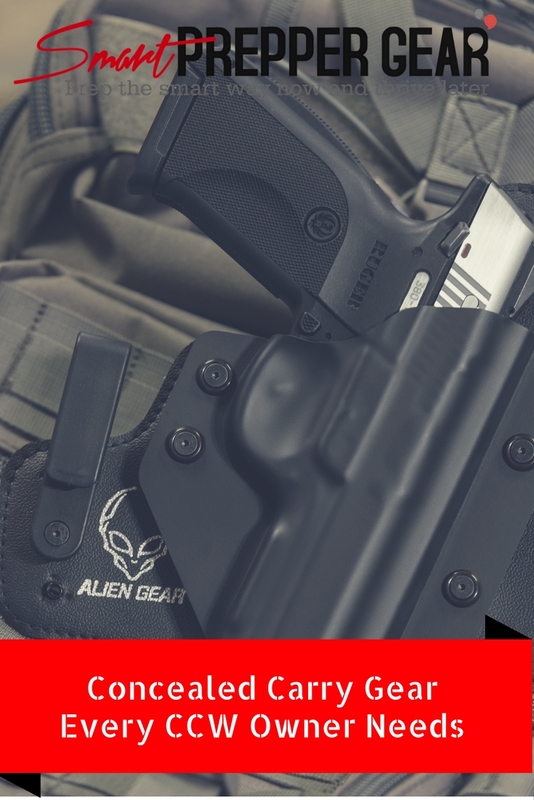 I currently use the Alien Gear Cloak Tuck 3.0 IWB Holster because it is extremely comfortable with breathable material that displaces weight of your CCW across your waist. It also wicks away moisture which is great for those of living in humid conditions or tend to get sweaty often. The holster is adjustable so that you are able to carry in different positions so you are not stuck with one carrying style. Gun belts are important to have when it comes to conceal carrying. Traditional belts are not built strong enough to hold that extra 3 pounds sitting on your waist. Traditional belts tend to lose their shape over time which affects how you conceal carry. Gun belts are made of reinforced leather that retain their shape. They can also handle the extra weight sitting on your waist. There are different styles of gun belts to choose from like traditional leather or you could with the “tacticool” look. My recommendation is the Trakline Gun Belt but there are other options that I wrote about HERE. Some CCW owners opt in to carry an extra magazine with their holster. Some people debate how someone will realistically go through two magazines in a life or death situation. However, it doesn’t hurt to be cautious. Two is better than one. Currently we still have to abide by unconstitutional gun free zones like schools, government buildings and bars, etc. So many times you will have to place your CCW back in your vehicle when entering one of the places. The downside of that is many guns are stolen from vehicles. In fact thousands are stolen from vehicles every year. The other downside is that if your gun is stolen and used to commit a crime you can be held liable. So in order to thwart that threat you should have a portable gun safe that can lock to the frame of your vehicle. This doesn’t mean that it can’t be stolen but it will make it harder for someone to steal. Many times robbers are looking for the path of least resistance. If they see that it is going to take more time and energy to take something then they opt out. When summers comes around a lot of us CCW owners like to wear shorts which is more challenging to conceal carry with. Some of us also work in conditions where it isn’t possible to conceal carry on the waist. Another option is to pocket carry. If you choose to pocket carry you will need an appropriate holster that doesn’t print. On top of that you will want to make sure that your pocket holster doesn’t affect how fast you can draw. Working out or going to gym while conceal carry is almost impossible. Our workout clothes are not designed to carry heavy items. On top of that you can’t typically wear a belt with your workout clothing. Trying to pocket carry while working is also risky because the CCW can slip out of your pocket when bending over or laying down. It also tends to swing in your pocket while running. This is why it is important to have a deep crotch conceal carry holster. Belly bands would be another option that tend to add pressure onto your stomach restricting your movement. The Deep Crotch Conceal Carry Holster from Don’t Tread on Me Holsters is a great option. The one that I picked up is super breathable and surprisingly comfortable. It sits perfectly on my waist without printing or restricting my movement when working out. On top of that you don’t have to settle for a .380 or something smaller. They carry sub-compact up to full size handguns. Of course I wouldn’t recommend carrying a full size handgun at the gym though. A concealed carry backpack is a great piece of concealed carry gear to have if you are not able to carry a weapon on you but need it close. It is also great to have a backpack to hold a backup weapon. For a good conceal carry backpack you will want one with a hidden compartment and is lockable. You will be surprised how many people snoop into your belongings. You don’t want someone to “accidentally” come across your CCW. One of the best concealed carry backpacks on the market is the 5.11 Covrt18 Backpack. This backpack is designed not to stir up suspicion or unwated attention with a tactical look. It provides a compartment that fits a full size handgun. It also provides a grab handle so that you can pick up quickly. There are other compartments that you can use for other EDC gear with a laptop sleeve, sun glass pocket and administrative pouch. Having a bright flashlight with your concealed carry gear is a force multiplier. You can either get a flashlight mounted on your CCW or carry one separately. It of course gives you the ability to see in dark locations but can also temporarily disorient an attacker if shined in their eyes. This can slow them to give you time to get out or to quickly take them down. Most likely you won’t ever get into a long gun fight where you will need to reload your magazine multiple times. However, let’s never say never. It is important to be prepared regardless. Having a speed loader is an important piece of concealed carry gear to help you reload quickly. This is especially helpful if one of your magazines malfunction and you need to reload a different one. Trying to reload a magazine by hand in a shoot out just isn’t feasible. Earlier I mentioned the importance of having a flashlight in your concealed carry gear but it would be an added bonus to have TruGlo Handgun Sights modded onto your CCW as well. This will help you to aim correctly in the dark. Now if you have a flashlight mounted onto your CCW it will be easier to point and shoot. These sights will just improve your precision. Altogether these would be my top ten suggested items to have with your concealed carry gear. Please leave a comment below if you have any additional suggestions or feedback. Your feedback helps the community to prepare the smart way now so that we can thrive later when SHTF.